The upcoming James Webb Space Telescope should be able to measure the composition of vaporizing exoplanets, giving clues about the makeup of their cores, mantles, and crusts. Amid the thousands of known exoplanets, scientists have labeled hundreds of them as rocky worlds on the basis of estimates of their sizes and mass, which give a rough idea of a planet’s density. Astronomers have also observed the spectrum of light generated by the outermost layers of some of those planets. A planet’s spectrum might reveal what molecules exist in its atmosphere but not what’s on the surface or deep below. Lacking a way to access that information, astronomers have no independent method of verifying what exoplanets are actually made of. Without this knowledge, they can’t learn whether Earth’s composition is common elsewhere. Now a new study shows that it may soon be possible to more directly measure an exoplanet’s interior composition by pointing an upcoming space telescope at a rare type of exoplanet: disintegrating worlds. Using models, researchers tested whether the future James Webb Space Telescope (JWST), NASA’s next large telescope mission, would be able to measure the spectrum of the dust tail of a disintegrating planet. They found that the telescope is powerful enough to return data that identify whether the dust originated from the planet’s core, mantle, or crust. These results will appear in an upcoming issue of the Astronomical Journal. The key to knowing the composition of a planet involves detailed study of a planet’s spectrum, the team said. Spectroscopy, the measurement of how something interacts with light over a range of wavelengths, reveals a signature of each chemical that the light encounters, which in turn gives clues to what that something is made of. Disintegrating exoplanets present an opportunity to see how light interacts with materials that once existed deep within the planet’s interior. Disintegrating exoplanets present an opportunity to see how light interacts with materials that once existed deep within the planet’s interior, Bodman and her team hypothesized. These exoplanets orbit so close to their host stars—with orbital periods of less than a day—that the star’s radiation vaporizes rock off of the planet’s surface. After the rock vapor leaves the exoplanet’s surface, it trails behind the planet like a cometary tail and recondenses into dust. The researchers postulated that as the dusty tail passes in front of the star, astronomers could take spectra of the dust itself as it filters the starlight and imprints a chemical signature upon it. This process, called transmission spectroscopy, is the same technique currently used to measure the composition of an exoplanet’s atmosphere. “We wish we could do something like that for Venus or Mars,” he said. Many Earth minerals, including mantle silicates like enstatite, forsterite, and fayalite, have strong chemical signatures at midinfrared wavelengths. The team found that the upcoming JWST and its Mid-Infrared Instrument (MIRI) would be just right for detecting the presence of these and other minerals found on Earth. 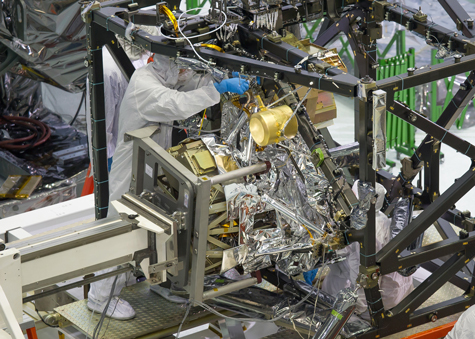 MIRI is a camera and spectrograph that will measure signals in wavelengths of light from 5 to 28 micrometers. The researchers tested their idea by simulating MIRI observations of one disintegrating planet, K2-22b, whose tail blocks the same amount of light as a planet 2.5 times the size of Earth and that orbit a star 60% the size of the Sun. They assumed that the planet’s dusty tail was primarily composed of seven known chemical components in Earth’s core, mantle, and crust. K2-22b has the strongest and most consistent transit signal of the known disintegrating worlds, explained Bodman, and would therefore be easiest for JWST to observe. In addition to those three mantle silicates, the researchers also tested the spectra of iron, carbon, quartz, and an aluminum-based crust mineral called corundum. Bodman and her team found that under the ideal conditions for dust grain size and density, MIRI should be able to distinguish between the different chemical components with just a single transit of K2-22b. Assuming that the locations of these minerals within the exoplanet mirror where they’re found within Earth, the data could differentiate core, mantle, and crustal components. “Webb should detect if there are silicates in the dust,” Bodman said. “If we’re lucky and observe during a fairly deep transit, we might be able to characterize which kind of silicates.” For example, the models showed that JWST may differentiate between enstatite and fayalite if the dust tail obscures 1% of the star’s light, a “deep” transit for K2-22b. However, the team found that if a star was dimmer than K2-22 or if the transiting dust tail produced a much smaller transit signal than K2-22b’s tail does, the core, mantle, and crust components might suggest multiple compositions, be indistinguishable, or be undetectable altogether. “This technique is definitely something we should try with JWST,” said Andrew Vanderburg, a postdoctoral researcher in exoplanet science at the University of Texas at Austin who was not involved with this study. Vanderburg, who has studied the light signatures of other disintegrating worlds, said that the technique might face challenges, like dust grains that are too small or tails that are too opaque to transmit light. JWST is the perfect telescope for measuring the spectra of these dust tails, Wright explained, because it was designed to perform transmission spectroscopy of exoplanet atmospheres at midinfrared wavelengths. The dust tail observations would be similar in style, he said, just applied to a different type of target. 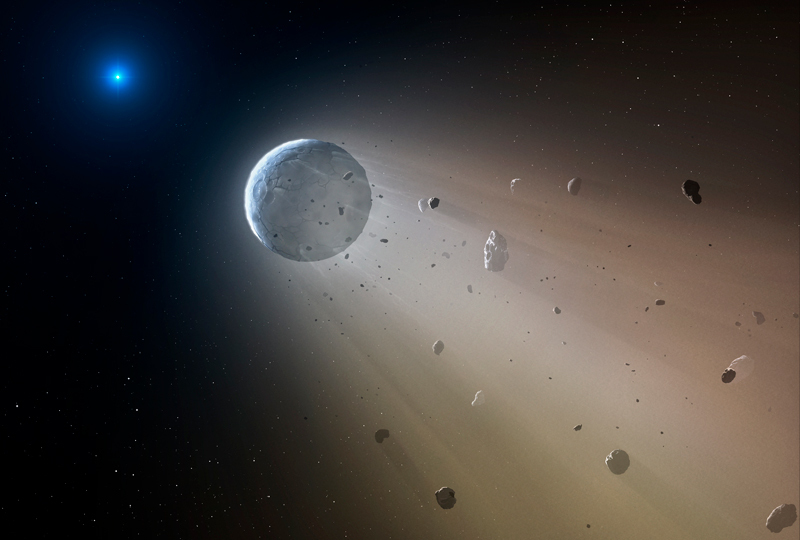 Disintegrating planets, however, are very rare, said Bodman. The exoplanet-hunting powerhouse Kepler Space Telescope discovered only three disintegrating worlds, including K2-22b, among hundreds of thousands of stars. One other, Kepler-1520b, may have a tail observable by JWST, the team found, but only if it is observed at just the right time. The team plans to use JWST to measure the spectra of K2-22b’s tail after the telescope launches in 2021. They are also hopeful that a few other disintegrating planets may be discovered by the Transiting Exoplanet Survey Satellite (TESS) and that some of those dusty debris tails may be observable by JWST. TESS, a NASA mission, launched earlier this year and should deliver its first round of discoveries in the next few weeks. Citation: Cartier, K. M. S. (2018), Webb telescope may detect minerals from shredded worlds, Eos, 99, https://doi.org/10.1029/2018EO105975. Published on 12 September 2018.